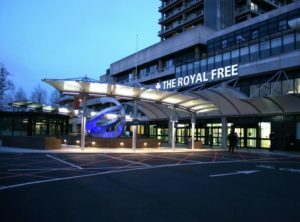 Building on our successful supply of doorsets to the Emergency Care Pathway at Guy’s & St Thomas’s Hospital Logan Construction have appointed Casey Doors as the door supplier to the to A&E Refurbishments works at the Royal Free Hospital. We are extremely proud to be appointed as the door supplier to this project and we’re looking forward to again working with Logan Constructions St Thomas’s Hospital site team. Ansell & Bailey are the architects for this project and this will be our first healthcare project with them, again we’re extremely proud that Ansell & Bailey approved our internally framed door design as the door solution for the A&E Refurbishments works at the Royal Free Hospital. This is a complex project that will be phased over 18 months which will require our fully HTM & HBN compliant Laminate Faced Doorsets & our Mediform PVC Encapsulated Doorsets.